Wouldn’t it be nice to quickly see which of your calls occurred during or outside of business hours? We just rolled out the ability for you to set business hours for each of your receiving numbers and then set auto-tagging rules around those hours. This can be used to spot trends in your calls that occur inside or outside of business hours. For example, would you like to see if your missed calls tend to occur during or outside of business hours so that you can make appropriate staff allocation decisions? Go to manage receiving numbers within the numbers menu. Go to manage tags within the reports menu and click tag settings to add a new tag rule. When creating the new rule, choose the “time of call” box. 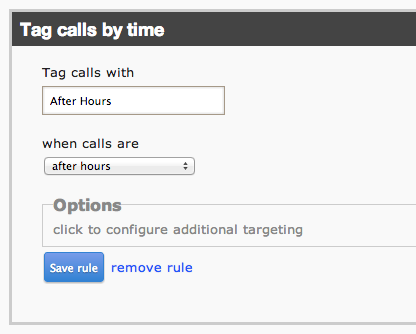 This will provide options for you to automatically tag calls around business hours. Thereafter, you will see calls come in as automatically tagged according to the rule you set up! Let us know if you have any feedback on this new feature or if we can be of assistance in any way.